Looking at radar patterns for winter weather around the great lakes makes a couple of observations pretty evident. Much, if not most of the winter weather involves cloud decks of 10,000 feet or less. This especially true for “lake effect” snow storms which are directly a result of the moisture contribution of the relatively warm lake water. The first image below shows streamers (darker blue) developing on the lee shore of Lake Erie as the moisture laden air cools coming onshore, and sets up a dump of light snow in Niagara and east of Buffalo. 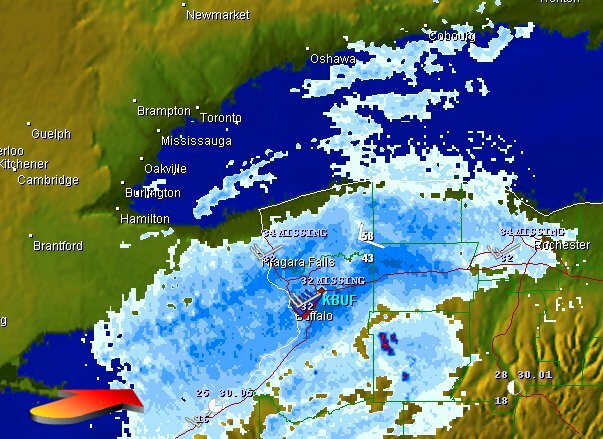 Lake effect snows tend to cease if the winter is cold enough to freeze Lake Erie and the western end of Lake Ontario. Subsequent snow after that comes from larger continental low pressure systems moving across the region. It is easy to see however, that until the lakes freeze, lake effect snow can impact any part of the shorelines depending on wind direction. The second image shows the Echo Tops pattern for the same period. The grey areas indicate tops of 5-10,000 feet or less. This is the radar interpretation of the vertical density pattern of moisture over the region. Its apparent straight out that these lake effect squalls are thin and have little vertical development. From a radar interpretation perspective this lack of vertical development is important. Since the radar beam sweeps upward at fixed angles relative to the horizon, it is easily seen that because of the shallow altitude of the cloud deck, the beam will overshoot the deck in a fairly short distance. This creates the idea that the event is very local to the radar site, when it fact it may encompass a very much larger region. The national maps at the top of the EWR pages will confirm how broad the weather pattern is, and illustrate why its important to understand the visual limit of the radar in low decks. The chart below will show the relationship between beam height and distance from the radar site. « Ephemerata Weather Radar is now back online full-time.